My husband and I just relocated from Midtown Manhattan to a Connecticut neighborhood stretched along the eastern bank of the Byram River, which, for a few miles, separates Connecticut from New York State. It’s beautiful here and much more suitable for our family with young children and a budget. We did not, however, enjoy a smooth move in. In fact, we sensed we were unwelcome by certain neighbors in our condo building, a few of whom yelled at us about creating too many broken-down moving boxes and about the noise our three-year-old makes when he trips over his feet and falls. We are the only family with children under 16; someone asked—twice—Why do you even want to be here? Why don’t you live in a house? But weeks later, we had—ok, we MADE—the opportunity to tell our story to one of these neighbors, and she told her story to us. And you know what? We get along well now. Our preschooler greets her dog like family. She hugs our kids. Another couple, having asked to hear our story, made us a coffee cake. I swear it was the nicest, tastiest coffee cake I’ve ever had. When I moved from my first elementary school job to my second, I met Katie Egan Cunningham. We attended a summer training program in reading education before the school year began. Within a few minutes, I think, we recognized that we were kindred spirits and became friends. Years of teaching, tutoring, talking, training, co-authoring, and hanging out, and we’re still kindred spirits and close friends. 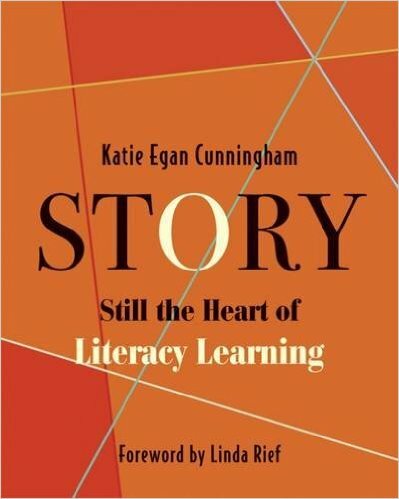 Katie and I carry with us a critical lesson from our days teaching second grade: kids must be surrounded by stories in order to learn, expand, and be kind. Our students were hooked on read-alouds, audio books, guest storytellers, and big-fish tales told in that zealous way eight-year-olds do over lunch-time bagel monsters. My friend Elizabeth Damewood Gaucher also trusts in the power of story, enough to have spilled energy and time into a brand-new market for creative nonfiction childhood stories. The new Longridge Review: “Our mission is to present the finest essays on the mysteries of childhood experience, the wonder of adult reflection, and how the two connect over a lifespan. We are committed to publishing narratives steeped in reverence for childhood perceptions, but we seek essays that stretch beyond the clichés of childhood as simple, angelic, or easy. We feature writing that layers the events of the writer’s early years with learning or wisdom accumulated in adult life.” By making space for creative nonfiction stories told from childhood memory and deepened by adult perspective (a venture that requires uncounted hours of work and love), Elizabeth helps writers’ stories to live, to come alive, to matter. A teacher education book and a new market for creative nonfiction play off each other perfectly. It’s all about story. Sit, read, listen, create. We always have. Learn, expand, be kind. We always should.